Insurance is a relic. Make it unnecessary! Insurance is available to provide protection against all sorts of unpleasant contingencies. If one has property one can obtain insurance against its being damaged, destroyed, or stolen. One can get insurance to defray the costs of illness or even death. The forms of insurance that are available are many and varied, and much of modern business would be difficult to carry on if it were not for insurance. It is, of course, a feature of traditional economies. 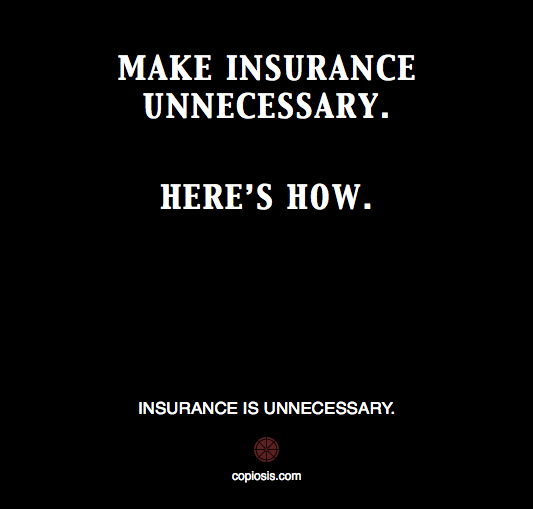 In a Copiosis economy, there is no insurance at all, of any kind, for anybody. This is because money cannot be transferred from one account to another. Money comes into existence in one’s account when earned and ceases to exist when spent. Therefore, one could not pay premiums and one could not collect money from a policy. Does this mean that people are defenseless against disaster? How does one mitigate the consequences of unfortunate events? Let’s consider life insurance first. One buys life insurance in a traditional economy in order to cover the cost of a funeral and provide for one’s dependents in the event of one’s death. In a Copiosis economy, one’s dependents will be just fine so long as material possessions are concerned. They will be given food, clothing, shelter/housing, medical care, and education without having to pay for it because those who gave them these things would be paid for doing so, whoever they are. Though no one is obligated to give Necessities to them, they will be paid for such giving, which is enough to see that your kin will have the Necessities. Also, if one’s dependents have earned money, they will not need to spend any of that money if they don’t want to. Therefore one doesn’t need life insurance. What about medical insurance? People will still get sick and become injured, but medical care is one of the necessities of life, and those who practice medicine will be paid for doing so. Thus, one needs no medical insurance either: Medical treatment doesn’t cost money in a Copiosis economy. But what about insuring property? If the property is a necessity, one gets it without paying. If the property is Capital Goods, one gets those without paying also. All that’s left is luxuries. If one doesn’t want one’s luxuries destroyed one will have to be careful with them. Protecting one’s luxuries is up to the owner, of course, but providing places of safekeeping for valuable objects is a beneficial service for those who own very valuable luxuries, so one would be paid for providing such places. Therefore, the property owner can store that jewelry or that painting in a vault and pay a rental. Fortunately, theft in a Copiosis economy is quite rare so that is of small concern. Finally, the loss of luxuries, though regrettable, is hardly going to damage the economy or result in harm to others. What about the various kinds of business insurance? Those policies are insurance against damage or destruction of Capital Goods such as buildings, equipment, or products. Again, we note that money doesn’t buy such things, so there would be no point in a policy which gave one money for their loss. The absence of insurance eliminates an entire category of the traditional economy’s crime from Copiosis economies. The resources which are devoted to the insurance industry in a traditional economy are devoted to production in a Copiosis economy. Much more attention is paid to preventing loss rather than to recovering money to compensate for loss. The lawsuits which today are a byproduct of insurance are completely absent in a Copiosis economy.